As a Massachusetts Institute of Technology (MIT) graduate student researching next-generation energy technologies, Brandon Wood recalls getting pumped when he heard President George W. Bush’s 2003 State of the Union address. The president envisioned Americans soon fueling-up their cars with hydrogen. A decade of trial and error has revealed that realizing the hydrogen highway dream requires starting very, very small. “We have to understand hydrogen’s atomic-level interactions,” says Wood, now a research scientist in the Quantum Simulations Group at Lawrence Livermore National Laboratory. At LLNL he’s doing just that: applying the world’s most sophisticated, fundamental molecular dynamics codes on America’s leading supercomputers to model hydrogen’s reaction kinetics. Wood has just started as the principal investigator on a $1.2 million DOE Office of Energy Efficiency and Renewable Energy (EERE) project. He leads a team of colleagues from LLNL, Sandia National Laboratories and universities to develop an efficient, on-board chemical-based hydrogen storage material. “The research is essentially revisiting what I did” as a CSGF recipient, says Wood, who’s now unable to remember the exact title of his Ph.D. thesis. Hydrogen-powered buses in several North American cities use hydrogen carried in pressurized cryogenically cooled tanks, but those are too bulky and heavy for widespread use in passenger cars. The as-yet unmet challenge is that the ideal chemical storage material must fully bind hydrogen at ambient environmental temperature and higher-than-ambient pressure, as when fueling a vehicle, but must also readily release the hydrogen at slightly elevated operating temperatures. During the past decade, Sandia scientists led the development of a list of potential low-molecular-weight absorbent metal-hydride storage materials. That consensus is validated by Wood’s research in the July 2014 issue of the Journal of Physical Chemistry C. The work described in the paper followed up on fundamental discoveries from Wood’s DOE CSGF research and helped to clinch his current EERE funding, he says. 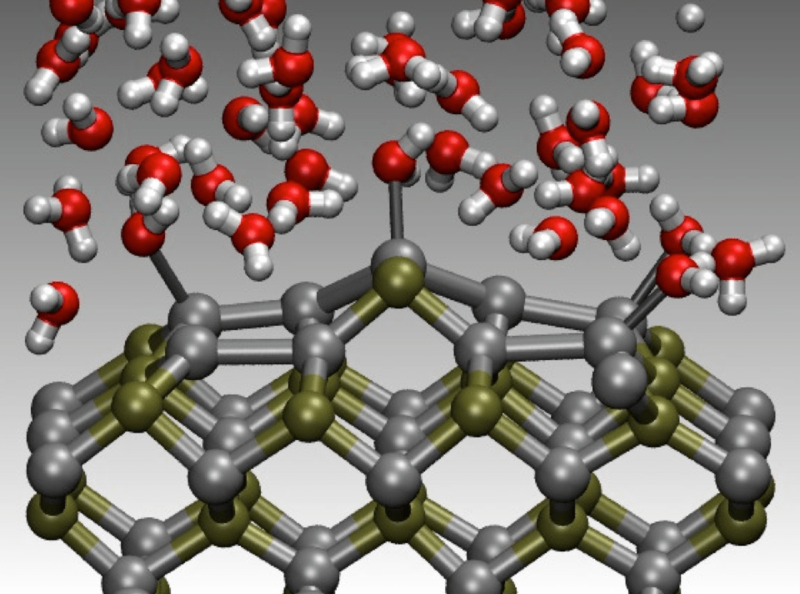 The paper, written with EERE project-team member and University of Georgia theorist Mei-Yin Chou, identified a critical atomic-level Achilles’ heel in metal hydrides. In the study, Wood’s team used ab initio (starting from the beginning) quantum mechanical simulations, run on supercomputers at DOE’s National Energy Research Scientific Computing Center and LLNL, to reveal the atomic-level dynamics of sodium alanate. Sodium alanate is a prototypical metal hydride. Its hydrogen storage capacity is too low for practical use but it’s one of the scant candidate materials whose reaction kinetics can be accelerated. The modeling discovered critical atomic-level changes during hydrogenation and dehydrogenation that alter the reaction dynamics. In sodium alanate, these changes accelerate absorption and release; however, Wood thinks that other metal hydrides don’t exhibit this same benefit, limiting their performance. The research will be the first to address this hydrogen storage conundrum using a sophisticated multiscale model integrating nanoscale ab initio calculations with mesoscale codes designed to describe phase changes. LLNL and University of Michigan researchers initially developed the codes to simulate lithium-ion battery electrodes. The modeling is forecast to use more than 80 million processor hours on one of LLNL’s leadership-class supercomputers over the project’s three years. The strategies will give the team’s experimentalists, Sandia scientists Vitalie Stavila and Leonard Klebanoff (with whom Wood brainstormed over lunches for six months in developing the proposal) direction for synthesizing new, more efficient, doped nanoparticle metal hydrides. Jacob Berkowitz is a science writer and author. His latest book is The Stardust Revolution: The New Story of Our Origin in the Stars.